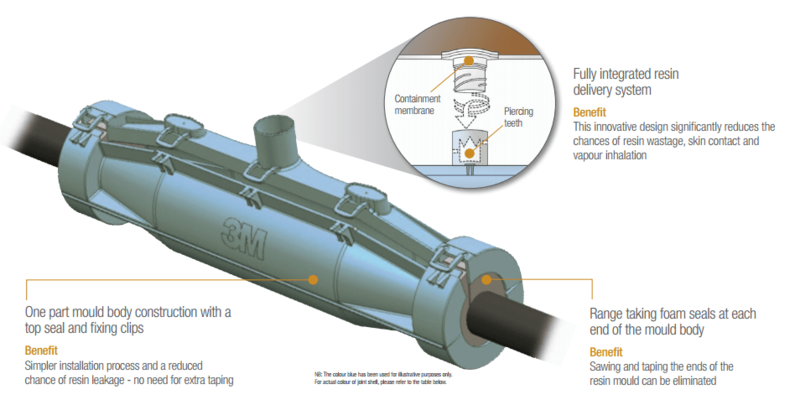 3M LVI-1/x PT Scotchcast resin cable joint kits are designed to be used for multi-core or multipair armoured polymeric Pilot & Telecom cables. Pilot cables are used for control, protection, signalling, telecommunications and data transmission purposes associated with power distribution and transmission systems. 3M LVI-1/x PT Scotchcast cable joints incorporate electrical insulation and mechanical protection and are compatible with both Cembre compression (crimp) or mechanical shearbolt connectors for conductor jointing of copper or aluminium cores. Jointing kits can be used for indoor and outdoor, underground direct burial and submerged applications in non-hazardous area locations – straight and transition joints (jointing dissimilar cable insulation types) including EPR, XLPE and PILC cable are available. 3M Scotchcast hazardous area cable joints are available for jointing power, pilot and instrumentation cables in Zone 1 and Zone 2 potentially explosive atmospheres. Where 5KV rated pilot cables are to be jointed an advanced specification Scotchcast joint with 15kV induced voltage sheath protection is available – the cable and joints avoid permanent damage from short-circuits on electronic equipment such as instrumentation, control and telecommunication systems, both at head-end terminals and substations. This reduces risk of electric shocks and injuries to people working on current maintenance and cable repairs. 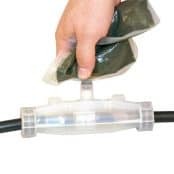 3M Scotchcast LVI-1/x PT resin inline or straight cable joint kits are supplied with a one part translucent mould body for simple and easy handling. Distances inside the cable joint body can be checked easily. All necessary dimensions, including kit application range, cable preparation are given in the detailed jointing instruction. The two foam sealing elements can be adapted to the required cable diameter by removing the pre-cut adapter rings. Scotchcast resin 470W is delivered in a two chamber bag with integrated spout and aluminium Guard Bag for protection of the resin against humidity. The re-openable seam and integrated spout with a membrane provides a 3M Closed, Mixing and Pouring (pictured) cable jointing system. After the seam of the two chamber bag is opened, the Scotchcast resin components can be mixed. To pour the resin into the mould body, the spout is connected with the dome by turning 180°. While turning, the membrane is cut open to pour the resin. The 3M Closed Mixing and Pouring System provides resin handling without any skin contact – for protection against pollution, a closure cap is applied onto the dome. 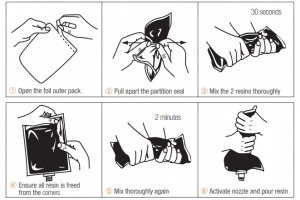 After curing, the remaining joint resin in the bag can be disposed as household waste. 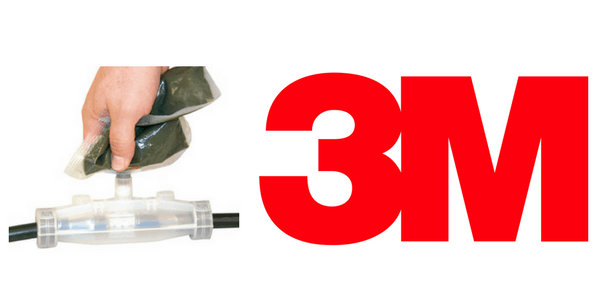 3M Scotchcast Joints – resin cable joints for power, control and instrumentation cables in industrial and hazardous area Zone 1 and Zone 2. 3M LVI-1/x-PT Scotchcast resin cable joints are tested according to EN50393. Scotchcast 470W resin is in compliance with EU regulation 1907/2007/EC (REACH) and has a shelf life of at least 36 months when stored between 10°C and 40°C with a humidity level < 75 % in the originally sealed bag. The expiration date of each product appears on the product label. Storage beyond the date specified on the label does not necessarily mean that the product is no longer usable. In this case however, it is the responsibility of the user to determine applicability of the resin. T&D Stock & Distribute the complete range of 3M Cable Joints & Cable Terminations using resin and cold shrink for LV, MV & HV cables.